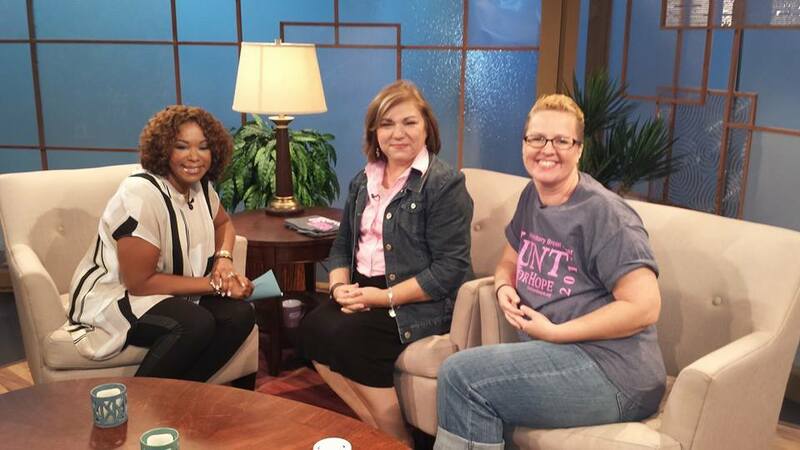 Today we were asked to be guests on the Debra Duncan show, Great Day Houston. We love Debra, she was kind enough to have us on the show earlier this year. She is very invested in our mission, for multiple reasons. First, she is a good woman, who cares about her community and the people in it, but she has also lived through a misdiagnosis, and understands first hand that we sometimes have to get a second, third or fourth opinion, to safeguard our health. I was there and told a bit of my story, but to have my sweet friend Staci with me was very important. Staci is the face of so many young women. She was only 37 when she woke up one morning and had mastitis-like symptoms. A mom of three, who nursed her babies, she has had mastitis, so she was familiar with it but thought, “This is different.” Within a few days, what had felt like an egg size mass was now much larger. She went to the doctor who immediately said, “This is not mastitis”, and diagnosed her with Inflammatory Breast Cancer, stage 3, with a mass about 14 centimeters in size. The time from first sign of a problem to diagnoses was 14 days. Our dear Staci passed away this morning about 8:30 am. Peace to her family. Staci, we will be your voice now.